and be sure to leave your telephone number so we may return your call. Please refer to our stock # maya67E when inquiring. 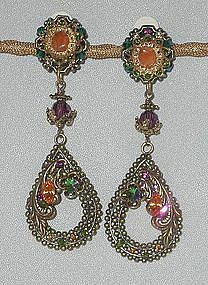 Maya's dangle clip earrings have colored rhinestones and genuine amethyst and carnelian, making a big splash against the antiqued metal. Glamorous and a little more conservative than a shoulder-duster! i 1/2" wide, 3 1/2" long.